How to create and view child records in the Fulcrum for Android app. Once in the repeatable section of a record, you can add child records in the same way as you would with a conventional record by tapping on the blue + icon in the lower right corner. 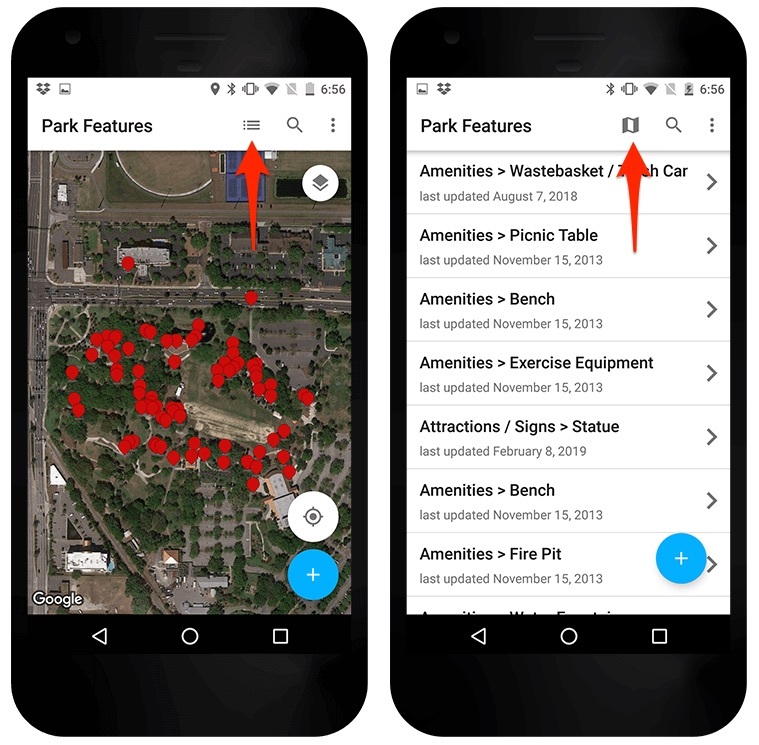 The default view for repeatable sections is the list view, but you will find a button to the right of the repeatable section name ("Park Features" in the screenshot below) that can be used to toggle to the map view. When you are finished adding child records to the parent record tap on the android back hardware button and then tap the save button to save the child records added to the parent record. To the right of the repeatable section name there are three buttons. From left to right, these buttons are the map view button, the record search button, and the overflow menu button. Map view button can be used to toggle over to the map view for the child records within that record's repeatable section. The record search option to the left of the map view toggle button that looks like a magnifying glass. This will allow you to search for records that contain the searched value. The overflow menu will have an edit option. This allows you to tap and drag on the records to change the ordering. The default ordering is the created at timestamp. To the right of the repeatable section name there are three buttons. From left to right, these buttons are the Google search button, the list view button, and the overflow menu button. The Google search button allows you to search for points of interest or addresses through Google. The map will center on the location that is found. This does not search any data contained with in your records. The list view button will toggle to the list view page where you can see your child records is a list view. The overflow menu will have the search items button which will allow you to search for records that contain the searched value.